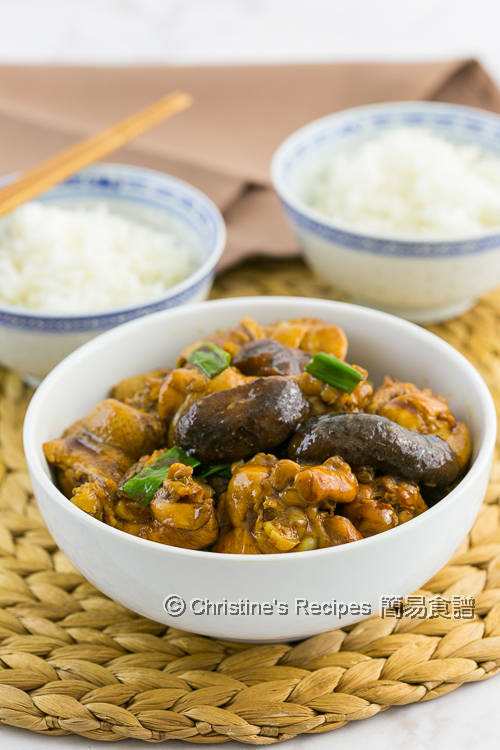 This is one of my favourite Chinese rice dish, Shiitake Mushroom Chicken Rice, traditionally made in a claypot. Recently I experimented with my pressure cooker. The pressure cooker version is a keeper for a hectic day if you don't want to stand in your kitchen too long. 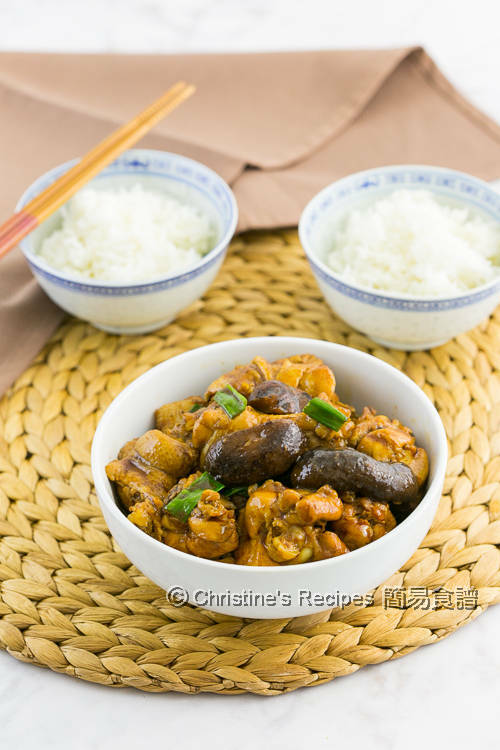 This Shiitake mushroom chicken rice is one of my favourite on-the-go recipes, just like one-pot-dish, tasty yet not difficult to make. Simply pop in all the ingredients in a pot. This time I put all the ingredients in my Instant Pot (electric pressure cooker). Mix the chicken with the marinade first. Saute the mushroom and chicken to bring up the aroma and bring out more flavours. 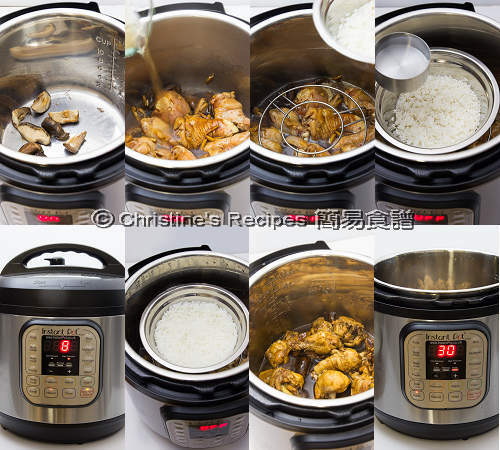 Then you can use high-pressure to cook the chicken and rice at the same time. The trick is to place a trivet or a shallow dish on top. Voila! Don't need to wait too long. I enjoyed a freshly steamed rice with braised chicken plus lots of yummy sauce. This recipe is my last-minute saver on a hectic day. 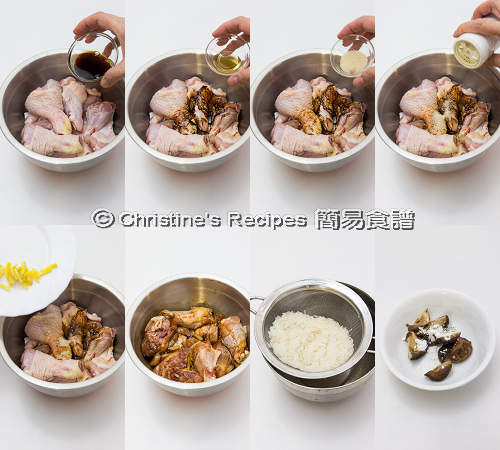 If you want to make it on stove, please refer to this previous steamed chicken rice recipe. Rinse the chicken drumsticks. Wipe dry with kitchen towels. Chop each into two halves if desired. Mix with marinade. Set aside. Cut each rehydrated shiitake mushroom into halves if too large. Rub with corn flour. Rinse and squeeze out excess water. Prepare Instant Pot: Press “saute” button. Heat oil and sauté the mushroom. Add chicken with marinade. Pour in 1 cup of water (mushroom soaking water in it). Place a trivet, a shallow dish on top. Put ½ cup of rice and ½ cup of water in the dish. Level the surface with a teaspoon. Close the lid, with pressure handle to “sealing” position. Press“manual”button, high pressure cooking for 8 minutes. Natural release 12 minutes. Open the lid. Remove the rice and cover to keep warm. Drain out the chicken. Press “saute”button and cook until the sauce is reduced by half. Stir in the thickening and cook to your preferred consistency. Add the dark soy sauce if you want darker sauce. Garnish with spring onion. Transfer the chicken with sauce in a serving bowl. Serve with steamed rice. Enjoy! By rubbing the mushrooms with cornflour, it helps the mushrooms develop a delicate and smooth texture, and taste a lot different. The chicken looks really flavoursome, Christine. This is definitely my kind of every day meal! Even if you add more chicken, each piece of chicken can be cooked evenly. Don't need to increase the cooking time. Hi Christine, I love your idea of steaming rice at the same time. It's brilliant! What dimension of dish do you use? Would I just double the rice and water for 4 people? Thanks! The stainless steel dish is about 6-inch in diameter, fitting just right. Sure, you can double the amount of rice and water. The instant pot will do the magic work for you.